During the conflict the Japanese army (with the intention of conquering all of Asia), decided to build a railway connecting Thailand to nearby Burma. That way the movement of troops and supplies toward India was quicker and more immediate. Tokyo’s primary objective was to avoid movements by sea, which was considered to be less safe. Constructing the railway were more than 50,000 people, the majority of which were American, Dutch, Australian and British prisoners of war along with Thai and Burmese civilians. Due to the number of people that died during the construction of the railway line, it became known as the “Railway of Death”. The quickest way of getting to Kanchanaburi is by car. If you’re fortunate and have Thai friends that have a car, that’s even better, if not you can rent one in the capital for a few Baht a day. At the airport in Bangkok for example you can rent a four-person car for a daily price starting at 300 THB. Besides the airport there are also other dealerships in the middle of town that offer this service, such as Sawasdeerentacar and Thairentcar. If you’d still like to go by car but don’t trust driving in the jungle of what pass as streets in Thailand, then your best option is to take a taxi. From Bangkok you can find taxi drivers willing to take you to Kanchanaburi, wait for you, then bring you back to Bangkok the same day for 3,000-4,000 THB. The price will depend much on your ability to negotiate with the driver. A little tip is to not behave poorly or aggressively, not even when you see that the best discount you’ll get will be from 200-300 THB. The taxi drivers in Bangkok are particularly known for not caring much for tourists, especially Westerners, and on more than a few occasions a few tourists have lost their patience only to have the Thai driver show them their best Muay Thai moves, or even a pistol. Even though some ten years ago negotiating with people in the land of smiles, as the Thai call themselves, was easy enough and beneficial for both sides, these days it’s no longer the case. Residents of the Kingdom of Siam have begun to associate the fact that you’re white with the fact that you have (lots) of money. They’ve become less willing to lower their fixed rates and the majority of the time you’ll need to be careful about how you negotiate because they have a low tolerance threshold and get offended veeeeery quickly! Buses for Kanchanaburi leave both from the north station of Bangkok, called Mo Chit (or often written also as Mor Chit); and the southern one (called Sai Thai Mai). From the North Station, buses for Kanchanaburi depart each hour. You can buy tickets right at the station, even a few minutes before leaving. The bus number you need to take is 9918. The ticket price is 122 THB a person, for first class buses, that is those with air conditioning where you’re given a bottle of water and a free snack. For second class buses the price is less (95 THB), and in this case too you’ll have air conditioning but won’t be served any food. Whether or not you decide to travel in first or second class, the trips start at 05:00 a.m., and 4:00 p.m. The travel time is 4 hours or more, depending on the traffic. From the South Station, buses leave every 15-20 minutes, and travel times vary between 3 and 4 hours depending on whether you decide to travel in first or second class. The first class bus costs 99 THB and has runs from 4:00 a.m. until 10:00 p.m. A second class ticket costs 77 THB, and regular buses leave every 15 minutes, from 05:10 a.m. to 5:30 p.m. Unlike Mo Chit, which is widely served by public transportation, the south station isn’t near any metro or BTS stops. The only two ways of getting there is by taxi (from the center of Bangkok it will cost about 150-200 THB), or buses numbers: 19, 30, 40, 57, 79, 123, 124, 125, 127, 128, 149, 159, 164, 170, 174, 177, 183, 201, 515, 516, 524, and 530. Another way for getting to Kanchanaburi from the middle of town is by minivan. You can catch one of these both at the south station of Bangkok, and Mo Chit (North Station), for a price starting at 150 THB. Travel times will be around 3 hours; trips start early in the morning (4:00 a.m.) and end when the sun goes down (6:20 p.m.). Tickets for a minivan can be bought at bus station or on the site 12go.asia. In my opinion the train is the best way to travel in Asia, giving you the opportunity to see the landscape and come into contact with the local people. The Bangkok-Kanchanaburi route is very popular, so I recommend that you book tickets a few days in advance, also because there are only two trains a day (at 07:45 a.m. and 1:35 p.m.) that offer this service at a price of 100 THB a ticket. Another point to pay attention to is that the train doesn’t leave from the central station of Bangkok (Hualamphong), but Thonburi, a small town located in the western part of the Chao Praya River. To get to Thonburi you can take a taxi for around a hundred Baht from the center of Bangkok. The train stops in Kanchanaburi city, at the Kwai Bridge, ending its trip in Nam Tok. Kanchanaburi can also be reached from the city of Ayutthaya, ancient capital of the Kingdom of Siam, located some eighty kilometers north of Bangkok. From the central bus station there are frequent connections with the city of Suphan Buri, both by normal buses or minivans. A bus ticket costs 50 THB, and takes two and a half hours to get to Suphan Buri. With minivans it takes only an hour and a half and the price is 80 THB. Once in Suphan Buri you’ll have to take another bus (number 411), for a price of 50 THB, which will take you to Kanchanaburi station. Recently a minivan service was introduced that for 350 THB a person, will bring you to Kanchanaburi without any intermediate stops. The travel time is two and a half hours and tickets can be bought at tourist agencies in the city. There are no direct trains from Ayutthaya that go to Kanchanaburi; if you want to go by train the only option is to go to Bangkok, and then take the direct train. There’s about seventy lodging options in Kanchanaburi. You can find cheap hotels like guest houses for 350 THB a night, or five star hotels for 9,500 THB a room. A special experience is to stay at the River Kwai Jungle Rafts Resort. This structure is formed of various bungalows located directly on the Kwai River, where in the evening you can eat awesome local food cooked by the owners. The characteristic that distinguishes it from other hotels is the fact that it doesn’t have any electricity, nor an internet connection. It is therefore ideal for those looking to get completely off the grid and relax. If you’d like to be in the middle of nature, the River Kwai Jungle Rafts Resort is definitely a great option; if you’d rather stay in the middle of town so as to more easily visit the main tourist attractions, a guest house like Baan Ma Feung is your best bet. Click here to read our reviews on the main hotels and hostels of Kanchanaburi. One of the main attractions to see is the Railway of Death. During the Second World War, the Japanese government wanted to build a railway to connect Thailand and Burma as quickly as possible. The early plans were drafted over five years, after which it was decided that the railway had to be constructed in just one year. In the end it was built in 16 months (from September 1942 to December 1943). During the construction many Western prisoners of war and Asians died such as Thais, Burmese, Indonesians and Malaysians. By the end of the war only 300 of the 415 kilometers total that the Japanese had built remained due to bombings ordered by the British Empire. 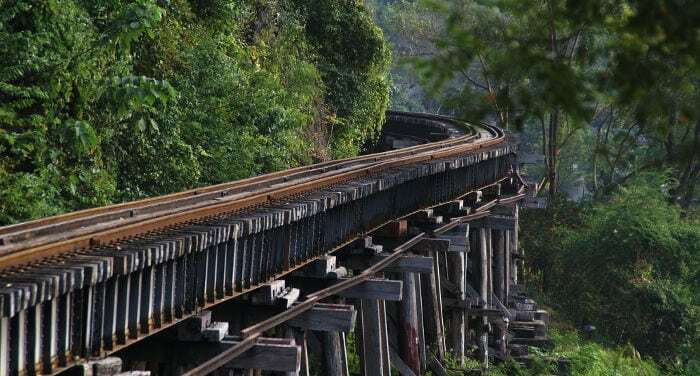 The railway was sold to the Thai government for a good 50 million Baht (about 1.5 million Euro). This part of the railway is still functioning and each year it is visited by thousands of tourists. One of the most interesting places crossed by the railway is the Kwai Bridge. This bridge has an interesting history since in November 1944 it was destroyed by the Allies. Two versions were then rebuilt (one in iron and one in wood) so as to prevent further interruptions in the case of bombing. If you’re especially interested in the history of the Kwai Bridge and Kanchanaburi in general, I recommend that you read the book by Boulle or watch the movie “Bridge on the River Kwai” from 1957, which won 7 Oscars. Today you can visit the bridge both on foot (be careful when the train passes; slowly, but it passes! ), or by train. If you’d like to know more about the Second World War in Thailand, you can also visit the JEATH War Museum. The name is an English acronym: Japan, England, America, Thailand, and Holland, namely the countries where the majority of those who worked on the construction came from. Inside the museum there are two areas: the first contains photographs, maps, tools and objects from the years of construction. The second (where photography is not permitted) is a reconstruction of the straw huts where the prisoners of war were held. Operating hours are from 08:30 a.m. to 4:30 p.m., and a ticket costs 30 THB for foreigners, and 10 THB for Thai citizens. Another reminder of the Second World War is the War Cemetery (in Thai: Don Rak). This burial place was designed by Colin St. Clair Oakes, and was built in honor of the victims of the war and those who died during the construction of the Kwai Bridge. Hours of operation are from 08:30 a.m. to 6:00 p.m.
A few kilometers south of the center of Kanchanaburi is another cemetery, the Chong Kai. Compared to the war cemetery, Chong Kai is smaller and covers a piece of land where the prisoners of the Japanese army lived. There are 1740 headstones, compared to almost 7000 at the Don Rak cemetery. Estimates suggest that during the construction of the Railway of Death over 100,000 people died, 60,000 of them civilians. Still in the Chong Rak area, near the Kwai Noi River, is the Thailand-Burma railway center. An entrance ticket costs 80 THB, and inside you can find the historical documentation of the Railway of Death: both its birth and partial destruction due to English bombings in 1945. While in the middle of town the main tourist attractions have to do with World War II, in the surrounding area the activities are dedicated to nature. Among the most beautiful and evocative places to see are the Erawan Falls. The Erawan Falls are located inside the national park of the same name, which covers over 500 square kilometers. The falls are divided over seven levels, each of which possesses natural pools of turquoise water. A ticket costs 300 THB, and once inside you can take a dip, catch some sun and do some hiking where if you’re fortunate you might encounter some rare animals. To get to the falls by public transportation you can take a bus from the central bus station in Kanchanaburi. The number is 8170, and leaves almost every hour. Bear in mind how long you spend in the park, because the bus takes two hours and the last trip for town is at 4:00 p.m.
Before June 2016, the Tiger Temple of Kanchanaburi was also a very popular tourist destination. Unlike other Buddhist temples, not only monks lived in the Tiger Temple, but also some one hundred tigers, the majority of them young. During a visit to the monastery it was possible to take a picture with a tiger in your arms or while bottle-feeding a cub. All this in exchange for generous compensation: 125 Euros to feed a cub. Since last summer however things have changed a bit; after several reports of mistreatment of animals (it was reported that the tigers were filled with tranquilizers), the Thai army raided the temple. Inside were found 40 dead cubs, and even elephant tusks ready to be sold on the black market. The temple is closed today. Its origins go back to 1994, when a few Buddhist monks saved a tiger specimen from the clutches of a tycoon in Bangkok who wanted to kill the animal so as to have it stuffed. The Thai police has estimated that during the temple’s 22 years of operations, the earnings well surpassed 100 million. The largest temple in Kanchanaburi is Wat Tham Sua. This particular religious monument can be seen from far off, thanks to its gaudy colors that recall the division between Thai Buddhist monks (orange) and Burmese (red). The temple is located in the Tha Muang district, and is made up of an enormous golden seated Buddha and various other buildings. From Wat Tham Sua temple you’ll have a beautiful 360 degree view of the Mae Klong River. To get to the top you’ll have to climb almost 160 stairs, or for 10 THB you can take a funicular. Hours of operation are from 8:30 a.m. to 4:30 p.m. (from 8:00 a.m. Saturday and Sunday). Even though Kanchanaburi became known to tourists the world over thanks to the film “Bridge on the River Kwai”, in reality the movie was filmed in Sri Lanka. Even the book written by Pierre Boulle has a small inaccuracy: though the railway goes along the River Kwai for many kilometers, the bridge doesn’t actually cross the river, but rather the Khlung Mae River. Since the film is based on the book, once it came out in theaters it created more than a few headaches for the Thai government, who decided to act sneakily so as not to lose the thousands of tourists who came to Kanchanaburi to see the famous bridge. For this reason the Khlung Mae River was rechristened as the Kwai Yai River. Today there are two Kwai Rivers: the Kwai Yai and the Kwai Noi. Another curiosity regarding Thailand’s role in the Second World War. At the beginning of the war the Thai monarchy took the side of the Axis, in particular the government in Tokyo, to which Thailand granted full operational freedom in its territory; in exchange the Japanese promised to respect the sovereignty of the Thai people. However, after seeing the direction that the war was headed the government in Bangkok decided ally with the Americans. When the war ended a large memorial was erected inside the roundabout at Victory Monument to celebrate the efforts of the Thai military.